@Lokki, yeah, that's what I was thinking, but thought I'd ask here first in case there were other known instances of this same thing happening. I didn't think it would be so simple as the glue issue since it's been a few months. I've already tried pressing hard on the dead inlay with my phone (silicon case helps prevent any physical scuffing to the phone). No dice, unfortunately. I'll email Support now. Thanks! Just last week one of my inlays died. I use the word "died" because it fails to register on any device I have with NFC (2 android phones and 1 Windows 8 tablet). As far as I can tell it is not working. I have had my ring for just short of 4 months now. Do you think this is a glue issue as well, or the inlay actually malfunctioning? Is there a way to test if this is a failure caused by the glue issue? My other inlay still works flawlessly with my Samsung GS3 (with case). Went through a checkpoint between CA and USA this past weekend: going into the US they required that I take off my ring, returning to CA they didn't care about my ring. 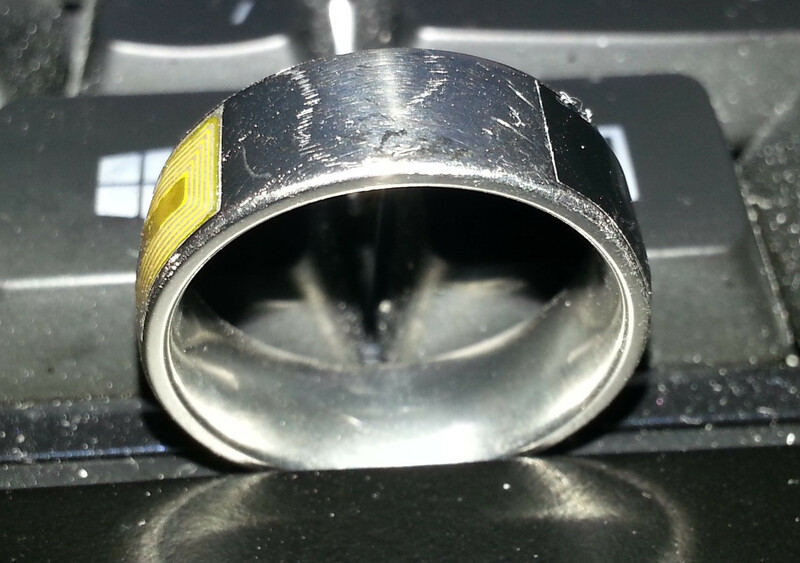 My ring still works just fine after going through the metal detector. So I guess it's good practice to take the ring off (since it's metal), but if they don't ask, then you're good to just leave it on and the tags won't get corrupted/erased/damaged. @asbath I tried the bridge from a local jeweler and I can say that it is surprising comfortable. My ring is just one size too big so the ring doesn't look too unnatural on the finger. If feels like wearing baggy legged jeans with a fitted waist: loose but secure. I did need to pad the part where it touches the finger since it didn't feel as comfortable as the comfort fit portion of the ring. Thanks! I'm glad that it works for you! I'm thinking that I may need to get a bridge, too, as I've been losing weight and getting thinner... and my fingers are following suit. I should have also mentioned that the jeweler indicated that you can ask them to give you a slightly larger bridge so that they can bend it, making it flush with the inside of the ring's curvature. This would make it more comfortable and has zero chance of "getting loose", so to speak, over time since there is no room for bending the bridge. I asked a jeweler about resizing a ring down to a smaller size, especially given the delicate nature of this ring. She had two recommendations: a bridge (which may not require any soldering) and beads. Wow. I'd dare say that you could give out 1 failed ring to each backer, and then still have enough left over for some other sort of grab-bag item. Do your inlays look like they're actually damaged? Or do they look as though there is no major physical damage even though they're dead? My ring has gone through all kinds of physical treatment, from your usual scuff up from moving computers and desks (just painted) to pulling an Abyss with some keep-the-door-open action. 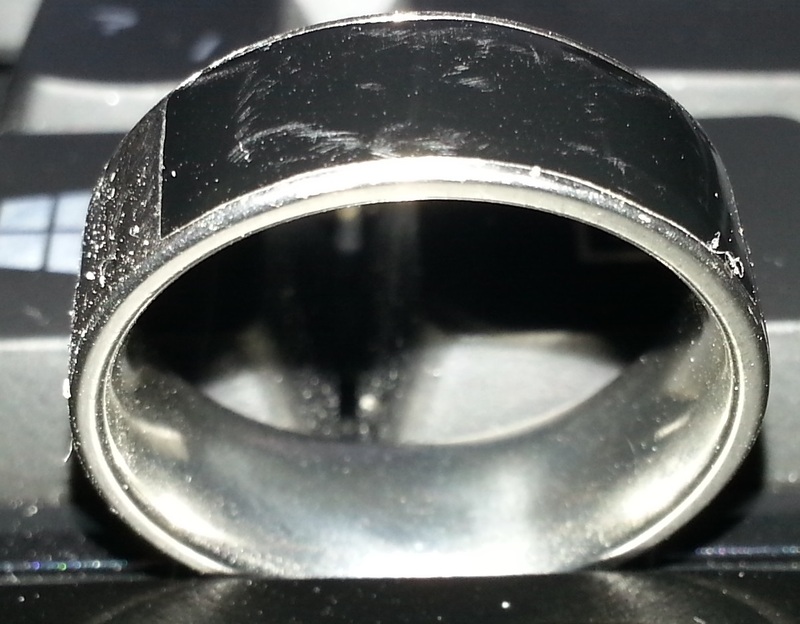 I have lots of scuffs all over my ring (pictures here, here and here), but so far there' sbeen no major damage to my ring. The inlays look completely intact and there doesn't appear to be any hard scratching or dents that dip into the inlays themselves. The protective outer coating seems to be doing an excellent job so far. I'm not intentionally trying to test the ring for physical wear, but I'm not trying to actively avoid it either. So far it's held up against everything workaday that I've tossed at it. 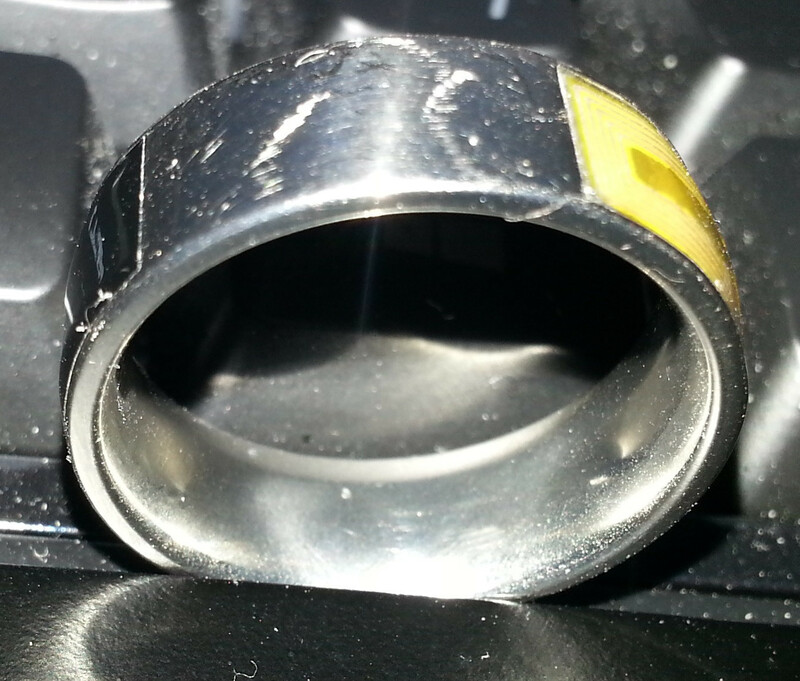 FWIW I haven't been babying my ring (titanium, transparent/black) and it's still working almost a month later. No problems with either inlay. I also play ultimate (lunch breaks with the office mates), and though I've scuffed up the outer polish, the inlays don't seem to have been affected by constant impacts with the frisbee (your usual 175g disc). Perhaps your original ring's inlays weren't secured properly by the cement? I found that my sweet spot on my S3 was right beside the "G" in the Samsung logo on the back, vertically parallel to the speaker. Basically if you drew imaginary lines from the speaker and "G", where those lines intersect is where my sweet spot is. I no longer need a sticker to remind me of that location because it's become muscle memory for me.